Burbn was a foursquare knock-off. A location-based app that let you check-in to places, earn points for hanging out, and post pictures. It was too complicated and had a massive churn problem. The developers started to use analytics to find out how users were using the app. They found that people didn’t bother using the check-in features at all. They only used the app to post pictures. With that data, the decided to drastically reduce the app's scope, and in one fell swoop drastically reduced their churn. Burbn died, and in its place Instagram was born. Everyone in silicon valley is looking for that magic bullet, a single change they can make that will crush churn, and make all their customers stay, content and happy with their service. That one tip, trick, tactic? It doesn’t exist. Even if you hit the jackpot and find a single change that can kill your churn, as Instagram did, it still requires a lot of work and a lot of data. "There's no one tip, trick, or tactic to stop churn, but a bulletproof retention process will slow it down"
Reducing your churn is an ongoing struggle, and will continue to be for however long your company exists. But that doesn’t mean that you should give up the fight. The key to fighting churn is to develop a systematic, defined retention process, that allows you to find all the small ways, the thousand tiny little tips, tricks, and tactics you can use to reduce your churn. Finding all these marginal gains will do much more for your retention than relying on one single gimmick, and if you develop the right process, you can repeat this success constantly, continually fighting churn and growing your business. Here are the steps you have to take to build a systematic retention process. A process that has been extensively written and talked about by Brian Balfour, VP of growth over at Hubspot. Brian's insight has given us the foundation to bring you actionable insight from generating ideas, to prioritizing, testing and analyzing. Following these steps can help you chip away at your churn rate every single day. A great retention rate is the sum of all the small gains you can make. You’re not going to get a 50% decrease in churn in one fell swoop, but you will find small changes you can make all over your product, service and company that will each reduce your churn. This won’t reduce churn overnight, but it will chip away at your churn rate and slowly help build your company towards growth. 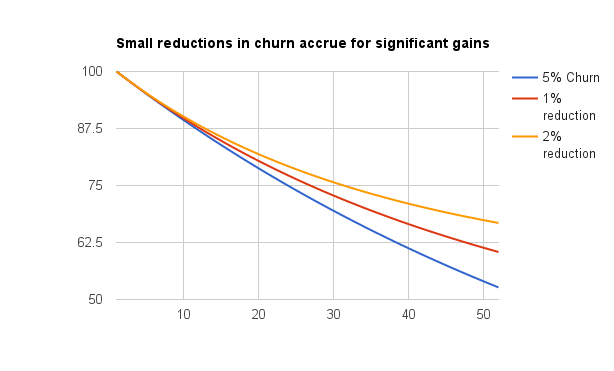 Even the tiniest changes in churn rate will have an effect. The blue line will always continue down to 0, whereas even 1% or 2% changes in the churn rate mean that red and orange lines will eventually level off, and start to curve upward into net negative churn. Most companies approach reducing their churn in an ad-hoc manner. They try a bunch of random tactics that they’ve heard worked at other companies, jumping from one to the other. All they’re hoping to do is get lucky and win the retention lottery. Churn is a multifarious, beguiling problem. There’s tons of reasons why your customers could be churning. In order to strike at the root causes of churn, you have to break it down into smaller, manageable pieces. In SaaS in particular, your business will be constantly evolving and changing, and new avenues for churn will continually appear. That’s why you need to build a process that reduces churn, not just to try and reduce churn one issue at a time. Here are 5 steps of a retention process, inspired by Balfours approach along with Price Intelligently data and insight, that will chip away at your churn rate in every area of your business. You need to set the goals for your experiment, then drill down into the specific questions you need, before analyzing the results to see how they fit with your objective, and then refining and repeating the process to turn your churn rate negative. Setting goals allows you to measure your progress through your retention process as you loop back from individual experiments, as well as set an end-point for the process. You set the goal at the start so everyone on the team knows what they are aiming for, and what you want to accomplish. Once you’ve set these goals, then you can start the process of looking over your existing data and feedback and defining the questions you need to ask and designing the right experiments to answer them. Mention allows people to track what is said about them online. As the service grew from a few hundred to a few hundred thousand, the company found that their current communication strategy was failing, and customers were churning as a result. The company set a specific goal of reducing churn by 20% in 3 months. They actually surpassed their goal in just one month, reducing churn by 22%. They did this through optimizing their support strategy, prioritizing trial and paid customers over free customers, as well as hosting webinars and developing an automated 'nurturing’ program to activate and convert trial users. Setting a goal and hitting it so early meant that that Mention could use what it learned to go further, using the time freed up from optimizing their customer support on learning more about how their customers used the product. When deciding what questions you’re going to ask, you want to drill down to specifics as much as possible. You want to brainstorm ideas for reducing churn in the short term, during the first few months of use, then brainstorm separate ideas for reducing medium term churn, then long-term churn. You can also segment customers by how they use your product, and target specific experiments at them. The further you narrow the scope and the more specific you get, the easier it will be to come up with actionable questions and concrete ideas you can test. For your process to work, you need to generate the right questions. You’ll have a good idea of what areas of your company are causing churn problems from user feedback and internal data. However, relying on just that might mean that you are missing the bigger picture. In his book The Innovator’s Solution: Creating and Sustaining Successful Growth, Clayton Christensen sets out 4 ways you can generate the best ideas for growing your business. You can use customer feedback — surveys, user testing, customer calls — to find out what their issues with the product are. In particular, exit surveys for customers that have already churned are a great basis for generating ideas for experiments. They will tell you exactly what is wrong with your product. It’s also perfectly valid to look at other SaaS companies and see what they might be doing to reduce churn. If you are brainstorming ideas for reducing short-term churn, then you can look at their onboarding flow and sales processes to find ideas for how your competitors are keeping people in those first few months. Question - To find the exact questions you want to ask, Christensen suggests going through all the questions that come to mind when discussing the topic. All of the Whys, Whats, Wheres, Whens, and Hows that you can possibly think of that are related to the different stages of retention. This is the start of your question pipeline as these questions will lead to answers, which will lead to more questions, until you have the exact questions you need to answer. Associate - Try connecting unrelated ideas to synthesize completely new ideas. If your SaaS product is directed towards a specific market, can you use ideas within that market to increase retention? If you’re building CRM software for sales teams, can you look at how ideas from the sales process can help with the retention process? Maybe this idea from left field is exactly what you’ve been looking for. Network - Don’t be afraid to ask others about their techniques. You're not asking them for their hacks, or tactics to reduce churn, rather what they think are the right questions to ask to formulate your experiments. You need to be constantly exchanging ideas with other SaaS founders to refine your process. Though you can ask for help, every company is different, and every product is different, with different customers and a different audience. What works for ProfitWell won’t work for the video marketing service Wistia, and vice versa. This is why silver bullets don’t work, and setting out a structure to reduce churn is the better answer. How do different onboarding flows help customers discover the product? Are we targeting the right customers? Could going upmarket help reduce churn? They experimented with new user flows for onboarding customers, different pricing plans for different types of users, and found that significant churn was coming from failed transactions. If they hadn’t broken down their churn into its component parts and experimented with the different parts, then they wouldn’t have been able to attack it on multiple fronts, and zero in on the real problem. Once you know the questions you want to ask, you need to build them into workable hypotheses. The point of developing a hypothesis is that it forces you to think about the questions you’re asking in more detail. In particular, you have to think about the impact any experiment is going to have on churn. Hypothesizing the impact any experiment is going to have on your churn is going to help you with your decision making, turning the multitude of questions you have assembled into specific ideas you can action and test. This is a way to understand your choices and how you can progress with your process. By developing hypotheses, you can also prioritize ideas, through defining the probability of success of the experiment, and resources needed for the experiment in your designated timeframe. Probability of Success - You’re not going to set a definite probability for your experimental success, but simply low, medium, and high. Resources Needed - Each type of experiment you run will require different resources. They might need 1 day of engineers working, or 1 week of marketing. You need to make a rough estimate of how much time and effort each idea you have generated is going to require to get the results you need. This is crucial to the retention process, and the hardest part, especially if you’re a small SaaS company, or just starting to develop a retention process. When you first run through this process and start developing questions, it will be difficult to gauge the impact of an idea or correctly define your resources. People often overestimate the probability of success of an idea and underestimate the resources needed for that success. But the more times you run through this process, the better you’ll get at estimating the time and resources that an experiment will take, and the more data you’ll have to back up your probabilities and impact. This means that on each iteration you’ll get better at your process and make larger retention gains. High Impact, Low Probability, High Resource: These are the 'magic bullet’ hacks. They might reduce your churn drastically, but are unlikely to work and will take up a lot of time and talent. They should be low down your list of priorities. Low Impact, High Probability, Low Resource: These are the ideas that should be high on your list. You can run through them quickly with little effort, and will yield results. Though those results might be small, you can get a number of them to all add up. The main gains come from those low resource, small impact ideas. These are the ideas and experiments that you can move through your process quickly, generating data and learning. Though you might have some high impact ideas as well, if you are going to move forward with them, then they need to have a high probability of success for you to prioritize them ahead of other experiments. When you have a list of ideas to reduce your churn, you then have to think about ways to implement these so that you can collect the data needed and see if they have the impact that you hypothesized. Patrick McKenzie, creator of Bingo Card Creator, a language aid for elementary teachers, noticed that there were significant drop offs in usage at every stage of the funnel for creating, customizing, and downloading the cards. He hypothesized that users weren’t aware that the cards would only take a few seconds to create, and believed instead that the process would take a long time. They churned. He created an experiment to test this hypothesis, adding in a progress indicator so the teachers knew where they were in the workflow. 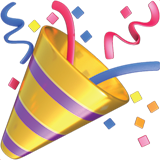 This small change increased completion rates from 82% to 90%. Here, every company is going to be different, and every experiment will be different, but what is important is to get the minimum viable test up and running as quickly as possible. Don’t overthink the experimental design or over-engineer a solution. You are looking for quick results, so you can learn from them and move on, either refining that experiment, or moving on to the next. It’s vital here that you invest in analytics that’ll actually help you measure and analyze what happened. A common issue is for people to tweak their products and services, but not to do the grunt work of wiring these changes up to any analytics to measure how their customers are now interacting with the service. Instead they decide to just eyeball, because they “know what’s gonna happen.” This is the exact opposite of what needs to happen. If you are building a process, you need the analytics in place to measure every single step your customers make so that you have the data to justify your hypothesis. Impact - What were the results of the experiment? Accuracy - How close were they to the original hypothesis? If a specific experiment increased retention, by how much? Was it close to your original hypothesis, or did the idea not have quite the impact expected? If the experiment didn’t reduce churn, what assumptions did you make in the hypothesis that led you to think it would, and how can those be fed back into the process to improve future experiments? This is the most important part of the whole process — it’s where you actually learn from the tests you ran and find the answers to the questions you asked. Ultimately, you’ll be looking for some reduction in your churn rate, but even if that didn’t happen at this point, you have still learned from the experiment about what you can do better next time. SaaS help desk service Groove had a churn rate of 4.5%. Even though the company was attracting new users, this churn rate meant growth was unsustainable. To combat it they started analyzing the differences between customers who churned and those that remained active, calling these differences “red flag metrics”. By analyzing the data, they realized that it took customers who later churned considerably longer to perform certain tasks on the site. They then used this data to target users that were obviously struggling, sending them emails and offering to walk them through setup processes. Through looking at their data carefully, they reduced churn by 71%. Your experiments will provide actionable learnings that you can use to move your service forward. If you saw a decrease in churn, but think the same idea can do better with some tweaks, then you can refine your process and repeat your experiments, reducing churn incrementally with each new idea. Once your experimental phase of the process is over, review your objectives, systemize your learnings, and optimize your process ready for the next challenge. Before you complete your retention process, you want to perform a post-mortem on your techniques so that you can optimize the process for future iterations. Were you improving over time? Did you improve your accuracy? Did you run enough experiments? It’s a process, constantly ongoing, and as long as you’ve done some damage to your churn rate and learned how to do even more, then you can re-adjust your goals for the next round and go again. Productize - If the reduction in churn came through something that can be changed in technology, this is how you should do it. If you’ve experimented with a new pricing structure, then you can now bake it in fully to your site. Anything that can be done in engineering and automated should be at this point. Checklists - Some things can’t be automated. If you’ve found that a new content distribution and promotion strategy has reduced your churn then that is hard to code into software. Instead produce playbooks and workflows so that the exact steps you took to reduce churn can be reproduced each time. Workflow management tools such as Process Street can simplify these procedures. Then you can ask the big questions. Did you hit your goals? If not, why not? If so, what can you do better next time? Once you have run through you process one time, you’ll learn so much about your service, customers, company and team that you’ll have even greater goals and even more questions the 2nd time round. Then you can zoom back in to attack different areas of churn with different ideas and constantly and continually fight churn until it goes negative, and then fight some more. During their retention process for Sidekick, HubSpot ran 11 different experiments trying to reduce churn. They all failed. But on each one they learned more and more about their product and their customers. Eventually they found that one answer was to send people back to their inboxes and away from the product once they had installed the app. This meant that they just started sending emails straight away instead of playing with the settings and not seeing the value of the service. They weren’t reducing churn during this time, but were still moving towards that goal, and by analyzing the data at each step, were able to narrow their questions and experimentation down to ideas that did eventually reduce churn on Sidekick. When Customer.io, a service for sending targeted emails, were looking for ways to reduce churn they realized that one issue was they weren’t converting high quality customers. Instead, they had more low quality customers, who weren’t a good fit and churned more frequently. 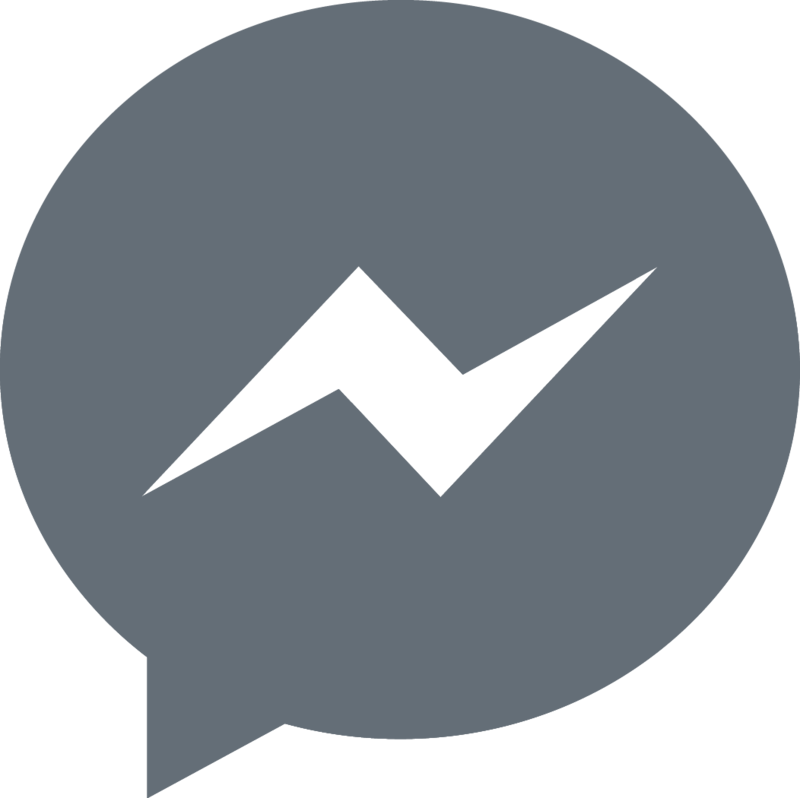 To combat this they experimented with concierge onboarding to convert higher quality leads. They defined an experimental group and a control group of 200 leads each. Both experimental and control groups received emails about converting to a paid account, but when leads replied, only the experimental group received 'concierge calls’, helping them to onboard into the product, iron out any reservations that they had, and allowing the sales team to discover more about the lead and their fit with the product. Goal: Customer.io wanted to keep churn low as they knew it was key to increasing their ARR to $1 million. Question: They brainstormed lots of ideas, using data and feedback to identify their main sources of churn, one being that they had a number of low-quality customers that churned. Hypothesis: They speculated that offering to walk certain customer’s through the product would lead to a) more customers converting, and b) offer customer.io a way to find out about the lead and their business. Refinement: They tried offering concierge onboarding at different times after the lead signed up, to optimize the conversions. They also continued to run the experiment, seeing how leads converted over time and where different types of customer churned out. Reducing churn should be a never-ending battle for your company. But if you construct a process that bakes retention directly into the core of your company, then it is a battle that you will win time and time again. The secret to fighting churn is that there is no secret. No tricks, no tactics — just good ol’ hard work. By using this process you can find every single small detail in your company that is causing people to churn, be it 1 customer or a 1000 customers. You can use this process to continually fight churn every single day, building it into the core of your service. The more you set goals, the more you ask questions, and the more you analyze data, the closer you get offering true value to your customers, and the closer your churn rate will get to 0.